It was a little nerve racking capturing this photograph at Laguna Beach last week. I was standing at the edge of total of disaster, hoping a wave wouldn’t take my camera out. 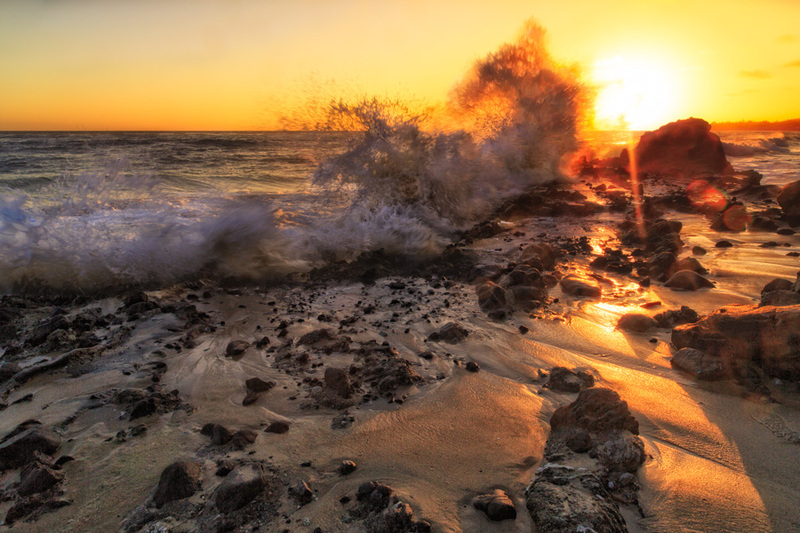 The sun was setting fast, it was high tide, and the waves were slamming into the rocks like I’ve never seen before. I was using my Zeiss 21mm lens, so I didn’t have the advantage of standing further back and zooming in. I took a gamble and planted my tripod into the sand. As soon i popped the lens cap off, my lens started getting misted before I could even snap my first shot. I was quite literally cleaning my lens between shots to avoid water spots appearing in the photo. I took a slight departure from how I typically photograph seascapes and used a faster shutter speed to freeze the intensity of the waves crashing before me. I really wanted to portray how man with all of his strength and wisdom, still does not have the power to overcome the forces of nature. As the sun continued setting beyond the horizon, the waves came to a calm and I just stood there enjoying yet another beautiful sunset.